Private Tour Services in and around TURKEY. We are licensed Tourism Company in Turkey dealing mostly with U.S based travellers coming to Turkey and neighbouring countries. Cruise Ship shore excursions as Istanbul & Ephesus Tours, as well as other locations. Tailor Made tours for your interest. Biblical Tours in Turkey and Holy Lands. Istanbul is one of the most populated cities in the world and the biggest city in Turkey. A great center for commerce and an important historical center where Romans, Ottomans and many other civilizations lived. Visiting Turkey as a globe traveler would surely bring you to Istanbul. Spending many days according to your taste you will be wondering what the rest of the country is like. 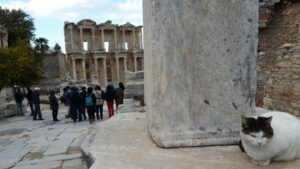 One of the best known location for a side day trip from Istanbul is Ephesus. The very best way to get there is by plane that will take you to Izmir. Otherwise the bus trip takes about 10 hours or driving distance is about 7 hours (I can drive you in 5 hours if you are brave enough 🙂 ..). There are many airlines that will fly to Izmir Airport from Istanbul airports. Depending on the time of the year the prices may change. After you land in Izmir Airport you can find many Rent a Car options at the airport. If you wish to take public transportation there are busses that runs to the City Center (Konak area) and there you can take another bus or a taxi to the main bus station to find yourself a bus that goes to the town of Selcuk where ancient Ephesus is located. This option might take about 3 hours. From there you might need to walk or use taxi between the places of interest. Or you basically rent a taxi from the airport to take you to Ephesus, which might be an expensive option.